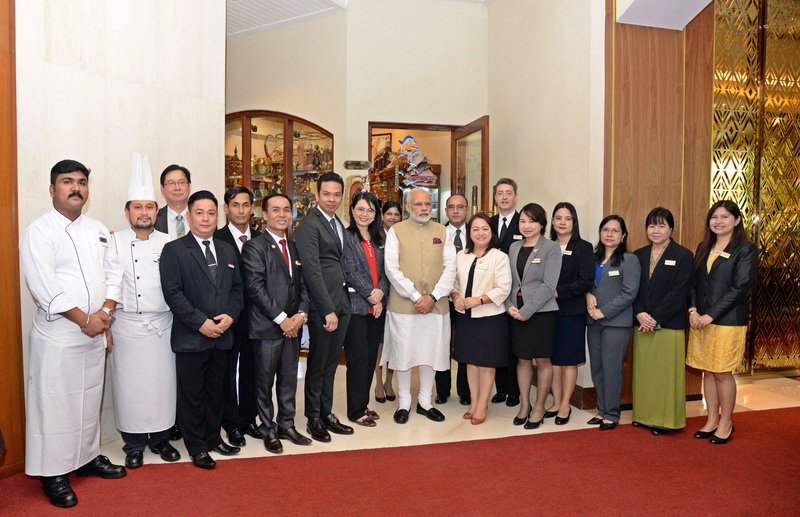 The management of Chatrium Hotel Royal Lake Yangon led by May Myat Mon Win, General Manager of the Chatrium Hotel Royal Lake Yangon (6th from right), welcomed The Prime Minister of the Republic of India His Excellency Shri Narendra Modi (7th from right), and the Indian delegation who stayed in the property during His Excellency’s State Visit to Myanmar recently. The Department Heads of Chatrium Hotel Royal Lake Yangon and the Diplomatic Staff and their families from the Embassy of India in Yangon offered a very warm Chatrium welcome to His Excellency and his delegation and were lucky enough to have a group photo taken with His Excellency before bidding a fond farewell upon his departure to New Delhi. It was a truly proud moment for the entire team at Chatrium Hotel Royal Lake Yangon to provide His Excellency with the hotel’s renowned levels of superlative service and we look forward to welcoming His Excellency back in hopefully the not too distant future.